Radiation is a therapy that uses high-energy rays of particles (photons, electrons) that target and destroy tumor cells in the location it is delivered. Radiotherapy is used to treat breast cancer in the areas that tumor cells may be present which includes the breast, chest wall and axilla (armpit) to prevent local recurrence. This therapy is often given on a daily basis for a 6 week period of time. Who receives radiotherapy for breast cancer? Not every patient that has breast cancer will need radiotherapy. However if you undergo breast conservation with a partial mastectomy (lumpectomy), you will receive radiotherapy after surgery as a part of your treatment plan. For patients who are considering or need a mastectomy, the need for radiotherapy is dependent on multiple factors that may or may not be known prior to surgery. Some factors include the size of the tumor, lymph node involvement, and age. Your physician will often send you to a radiation oncologist who specializes in radiotherapy to help determine your need for radiotherapy. How does radiotherapy affect breast reconstruction? Because radiotherapy affects healthy cells as well as tumor cells, reconstruction is often reserved after radiation therapy is delivered especially if you are considering using your own tissue for reconstruction. Plastic surgeons will wait often 6-12 months after radiotherapy to perform the reconstruction to allow the acute effects of radiation to resolve – decreasing your risk for complications. Also, most plastic surgeons will not recommend the use of implants if a patient has had or will receive radiotherapy due to an increased risk for complications including capsular scar contraction, infection, fluid collections, and poor cosmetic outcomes. 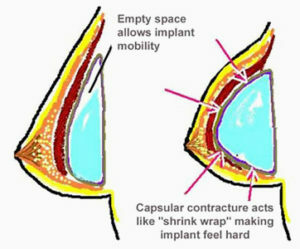 Some plastic surgeons may also place a tissue expander at the time of your mastectomy if radiation is uncertain at the time of your mastectomy. The placement of the tissue expander allows the mastectomy skin to be preserved and also allows the delivery of radiotherapy if a patient is found to require it. When can I receive reconstruction? How will the radiotherapy affect my breast with a partial mastectomy or my reconstruction if I am getting a mastectomy?